No, not offensive email that will get you in trouble with HR, just with the recipients of your emails who already have enough bloat in their inboxes. This email is all wrong. Don't send it. The information block in your email signature is excessive. Internally, we know what company you work for. Externally, the title/department information probably won’t mean much. You’re sending an email for a one word reply. I know acknowledgment is necessary, but coupled with everything else, it’s excessive. You have an image that’s larger than the rest of your excessive signature block and message body combined–and it’s taking up way more space in email [if you’re using Outlook] than it did on the computer you copied it from. A fun game to play when you have a completely unmanageable inbox is to start replying to long email threads that you were included on but never participated in. It helps if the administrators of your mail system allow messages to stick around for about 3 months–usually long enough to potentially impact a decision, but way too late to do so without tremendous cost. The key is to remain inconspicuous about your trolling. You must raise legitimate concerns, but not be too adamant about decisions being changed. The best policy is to plant little nagging doubts in everyone’s minds, then walk away. Start with the oldest threads first, resurrecting them in mid-discussion, then sit back and watch the discussion re-ignite. Repeat in sequence with newer threads in your inbox once the entertainment value of the current thread dies away. I have to admit, if you’re going to fail spectacularly, email is no longer the best option. You could publicly insult a client company’s home city. You could publicly insult your future employer by name. You could shamelessly use a crisis to promote your brand with a joke in poor taste. Or, you could make light of a national tragedy and insult 75% of the customers of the company you represent. The upside of failing on Twitter is that everyone following Twitter news seems to have such a short attention span, that… oh look a cute kitten. Still, if you want to fail on a deep, personal level, email is still the way to go. Email allows you the space to make you think that your sarcasm or bad humor is getting across, unlike Twitter, which limits you to 140 characters. More importantly, unlike phone conversations and face-to-face meetings [assuming no external recording devices are used], email always leaves a somewhat permanent record of your poor judgment. When someone sends an email asking for confirmation before proceeding, be sure to respond in a font 4 times the size of all prior correspondence. …ALL CAPS helps as well. Be sure to add sarcasm to your response, but be careful not to indicate sarcasm in any way. Your readers should be able to recognize the sarcasm unless they are complete idiots, in which case, they deserve to take the response the wrong way. Be sure to use non-neutral and high contrast foreground [lime green]/background[fire engine red] colors in your response, in order to simulate a migraine in the person reading your response. Be sure to reply to all whenever you’re angry. This increases the likelihood that someone will respond quickly. Whatever you do, don’t hesitate to use email when you’re emotional. Talking on the phone or in person can only show weakness. In email, everyone’s a WARRIOR. Once upon a time, in what people used to call “grammar school”, the exclamation point was a thing of mystery. It was generally something that seemed to never have a use in writing, with the exception of after an interjection or a strongly emphasized command. So, when did exclamation points go from “to be used as sparingly as capsaicin extract in chili” to “like salt on french fries?” It seems as though any reply of gratitude via email, text, or instant message requires at least one exclamation point if you’re grateful, and two if it was a big help. Don’t underemphasize your gratitude with a period. It may come out as a forced “thank you”, similar to the way your parents made you thank an aunt for an ugly sweater. Some people even extend this required emphasis by put things in ALL CAPS. Maybe we should suspend coffee service to the office for a while. Stop sending powerpoint slides exported to bitmaps via email. I feel like I’m playing a game of digital whack-a-mole with my email. My inbox keeps bumping up against its quota. I then spend X amount of time weeding out my inbox, archiving folders, etc., to get the email that is on the server down to 40% of my quota. I then leave for lunch, only to find another 5% of my quota eaten up by 3 broadcast messages. Did you know you can export a PowerPoint slide to a bitmap image? 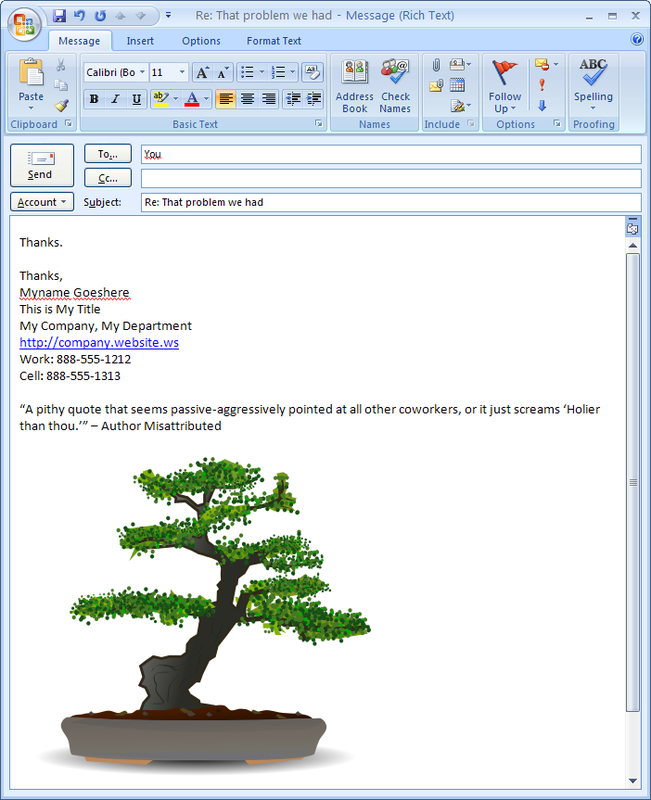 Did you know you can copy and paste that same image into an email? Did you know you can paste the same stuff into a calendar invite that you can put into an email? Well, just because you can, doesn’t mean you should. Sure, my inbox quota is tiny by modern computing standards, but this is all the more reason not to attach large images in an email. Of course, a picture is worth a thousand words. Unless it’s a picture of 50 words on a PowerPoint slide. And 50 words in light green on a white background is probably worth less than 50 words. One more thing: If you send important things like agenda updates or such which are embedded in this exported PowerPoint slide, Outlook will not find them. It doesn’t know how to read the text in an image.